WOW! There's got to be some significance with the recurrence of the number 13 today. We've got Peachy Keen Challenge #13 on Friday the 13th!! I'm not one bit superstitious about the whole Friday the 13th thing. I was born on the 13th. Not on a Friday, but I've had lots of birthdays on Friday, and I can't tell you they were any different than any other birthday. Now, this Friday the 13th is special, because we get to join the new challenge over at the Peachy Keen Challenge Blog, and this is one of the ever popular Anything Goes challenges. That's all there is to it. Just create whatever your heart desires, and as long as you use Peachy Keen Stamps, you'll be entered for a chance to win a set of Tul Color Permanent Markers. 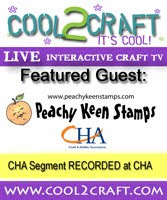 If you play along with each challenge this month, you could win a $30 Gift Certificate to the Peachy Keen Stamps Store! Now, THAT'S a great deal! My design teammates have created some beautiful projects for this challenge, so be sure to check out the blogs of Amanda, Amy, and Cristina to see what they've done for this Anything Goes Challenge, and please leave them some love while you're there, too! Here's my card for this challenge. I'm REALLY loving these new stamps that were released last week! Have you had a chance to snag yours yet? This card showcases stamps from the PKSC-04 stamp set, and the PK-106 With A Cherry On Top set, as well as the Peachy Picks Kit for April. WOW! What a great combo to work with! If you haven't had a chance to pick up the new stamps yet, then I've got some GREAT news for you! Beginning today, there's a BIG sale going on over at Peachy Keen Stamps! The sale goes from now until Sunday night, and there are fantastic buys on much of the merchandise. Want some more good news? There are even MORE NEW STAMPS available today!! Check out the adorable Here Kitty Kitty and Cherub face stamps! They are SO CUTE!!! Well, I think my work here is done. I think I've given you plenty of good news and enough enabling to keep you busy for a while! ;-) So happy you could drop by today! Have fun, and happy stamping! This is beautiful Lorie!! Your work is always so inspirational! Thanks for sharing and hope you have a GREAT Friday!! This card is so cute. Love your coloring. Oh Lovely, I am going to have to scraplift that idea.